The DTS26W17-35JB from Deutsch is DTS series, MIL-DTL-38999 Series III equivalent straight plug with 55 contacts. DTS series connectors are available in wide range of shell materials and finishes in 9 shell sizes (09 to 25) with 48, 500, 1000 and 2000 hour salt spray plating exposure. 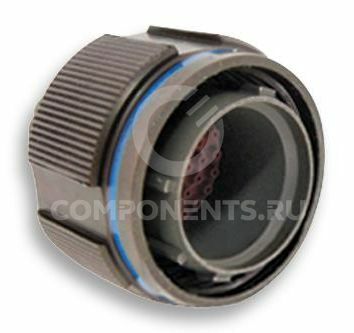 These connectors offer high density contact arrangements in a miniature circular shell and combines high coupling durability. It is designed to withstand the extreme shock, exposure and vibration. These connectors are fully intermatable and intermountable with all other manufacturer's MIL-DTL-38999 Series III connectors. Вы можете купить DTS26W17-35JB от 1 штуки или оптом, работаем по безналичному расчету с юр. лицами. DTS26W17-35JB цена и наличие по запросу. Ждем ваших заявок! Цена DTS26W17-35JB зависит от объёма заказа, на данный момент стоимость DTS26W17-35JB в нашей компании дается по запросу. Cрок поставки и конечная цена рассчитывается индивидуально для каждого клиента.